Bridal accessories are fun and easy items to shop for and they add a bit of personality to any wedding. From shoes and jewelry to toasting glasses and cake servers, accessories are important details on your wedding day. As you begin planning the major aspects of your wedding, keep an eye out for special or unique items that will reflect your own personal style, hobbies or passions. Though it may be tempting, avoid procrastinating on these seemingly simple purchases. Some selections may require special order, so be sure to allow several weeks for shipping. If you’re creative and have the time, handmade accessories are a wonderful addition to any wedding. A hand-sewn ring bearer pillow that matches the flower girlís basket is a lovely touch. Craft shops and fabric stores carry the necessary supplies to fashion the perfect accessories or enhance store-bought items. Many bridal salons carry limited selections of guest books, toasting glasses, cake knives and cake servers. For a more extensive selection of these items, visit a bridal store that specializes in bridal supplies and accessories. Should you receive a wedding accessory as a shower or pre-wedding gift, make sure that you use it in the wedding. When beginning your search for the perfect gown, arm yourself with the language and knowledge of wedding gown-speak. A-LINE: The A-line silhouette has a fitted bodice, and the skirt flares out gently from the waistline to the hemline. This gown style gets its name from the “A” shape it creates: small at the top and larger at the bottom. Good for: Almost every figure. BALL GOWN: The ball gown is the most traditional silhouette (think “Cinderella”) and features a fitted bodice and waistline with a very full skirt. Good for: Drawing attention to a small waist and hiding full hips. EMPIRE: This silhouette features a high waistline that is right beneath the bust line leading into a slender skirt. Good for: Hiding a thick waist and adding length. MERMAID: The Mermaid silhouette is a form-fitting style that accentuates curves and flares at or just below the knee. Good for: Tall & slender frames and adding length to a petite figure. PRINCESS: Similar to the A-line, the Princess silhouette includes a sculpted bodice and skirt that flares gently to the hemline, and it’s vertical lines mean basically no waistline. Good for: Elongating a short waist and petite figures. SHEATH: The Sheath silhouette features straight lines that follow the curves of the body. Good for: Slimmer figures, both tall and petite. We’re all different (thank goodness!) and it’s important to find a dress style that flatters your body. Emphasize the positive aspects and minimize you less-than-ideal areas that we all have. Select the best description(s) for your body below, and we’ll point you in a suitable direction. These are suggestions, and are NOT set in stone. The bottom line: try on many different styles – you’ll know the right one when you see it. PETITE / SHORT: Sheath, A-line, or Mermaid are all flattering styles on a petite figure. To add height, combine a short sleeve or sleeveless dress with long gloves. Also consider a dress with a high neckline and empire waist to elongate your figure. Big ball gowns and veils that are longer than the floor can overwhelm a petite frame. FULL FIGURED: Ball gown or A-line styles are especially flattering on fuller figures. The fitted waist and full skirt of a ball gown emphasizes your beautiful curves, and hides any figure “issues” below the waist. An A-Line silhouette will flatter practically any figure. Consider a neckline with beading and other details to help draw the eye upward, and balance your silhouette. LARGE BUST: The following necklines work well with a large bust: keyhole, high, v-neck or illusion yoke. You may also want to consider finding a gown style that allows you to wear a bra with straps, for the best support. It’s all about proportion and balance, so consider a dress with beading, lace and other details around the hemline and the bottom half of the dress, versus the bodice. FULL HIPS: A-line, ball gown, flared skirt, or cinched waist styles are all very flattering to this body type. A broader neckline such as off-the-shoulder, Portrait, Bateau or Sabrina can help balance your overall silhouette nicely. SMALL BUST: While many styles can be flattering, consider styles that include extra details – layering, beadwork, ruching, lacework, etc – around the bust line for fullness and balance. 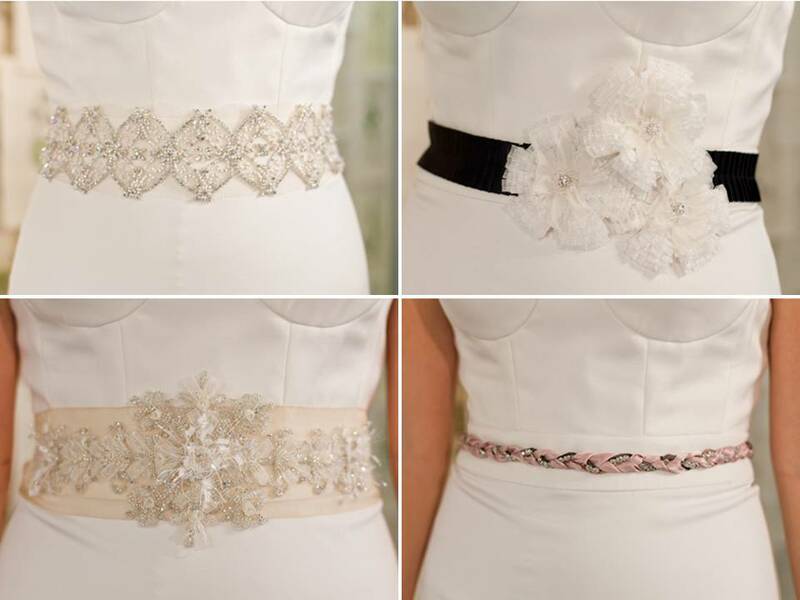 Have cups sewn into your gown’s bodice so you can eliminate the need for a bra – one less thing to worry about! HOURGLASS: This “curves-in-all-the-right-places” body looks great in simple, classic styles such as sheaths, mermaid, or a fitted princess gown. Consider a v-neck, off-the-shoulder or scoop neck – these necklines provide nice balance and proportion to an hourglass shape. INVERTED TRIANGLE: Full skirts or full trains are a great way to balance out your overall silhouette, when you’re fuller on top and through the shoulders. Also consider dresses with bustles, bows, and other adornments on the bottom half of the gown. TRIANGLE/PEAR SHAPED: Consider full sleeve treatments, padded or pouf sleeve to balance out your fuller bottom half. Also consider a textured bodice with heavy beading, and flattering neckline that will draw focus upward. TALL: A drop-waisted dress with a lower neckline or any off-the-shoulder style looks great on taller figures. If you’re also slender, a sheath or mermaid style will really show off your slim frame. Sometimes when you’re thin, your shoulders and collar bone can look “bony” – and if so, you may want a dress style that covers those areas more. Something else to consider: pouf veils and up-do’s will add to your overall height. THICK WAIST OR RECTANGLE-SHAPED: An Empire silhouette looks especially flattering on those body types that are fuller through the waist. Consider using strong detail on the upper or lower body, but not both, to give the illusion of curves. ll eyes are upon you as you glide gracefully up the center aisle. Your handsome groom gazes at you with love and adoration. Everyone wants to take your picture. Once you combine your special sense of style with a few tricks of the beauty trade, you’ll look your absolute best.